Welcome to Biblical equipping services! Transformation for the glory of God and the good of people is what this ministry is all about. We focus on educating children and training those who teach them. We offer biblical equipping services because God's Word offers wisdom for this life and instruction on how to safely enter the next one. We are motivated by God's amazing love which he showed in Jesus Christ's death and resurrection. Jesus is the dynamic, powerful Creator and His Holy Spirit is at work transforming all who will humbly come to Christ. We offer a number of exciting specialized services. Take a look around and let us help you meet your need. You can also be a part of making it happen. 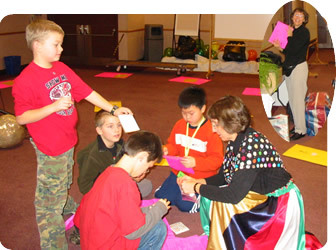 "That was fun," one child said as he left the room at the end of a two-hour spot at Missions Fest Vancouver 2006. 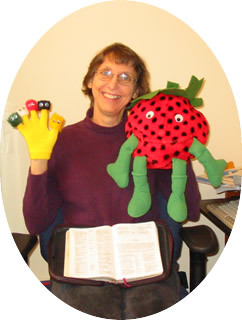 Yes, learning the Bible in hands-on, interactive ways is the best way to send a child forward with a happy heart, equipped for this life and the next. Even though time has passed since these pictures, we are still doing hands on learning with children! To request services see the contact information below. Questions about our services? Wish to join the team? Need spiritual help or want to know more about the Bible? Please use the email address below.